Home » Musings » Revelation: I enjoy Chinese women magazines more than English ones! Revelation: I enjoy Chinese women magazines more than English ones! I should have paid attention in school when they were trying to teach me Mandarin. Its not my fault – I was traumatized by the language at an early age, no thanks to a teacher who refused to teach. So I remain pretty illiterate in the language till today. And the reason I wish I could read Chinese is because I’ve learnt that Chinese women magazines are so much more informative if you enjoy cosmetics and fashion! This revelation struck me while I was at my hairdresser last week. Some Mak Datin was hogging the English mags and I wasn’t interested in the Tatler, so I picked up a bunch of Chinese magazines. Some were local, some were from Taiwan. But in the main, I was impressed. I can’t read Chinese but the pictures were sufficient. There was so much information in there! Not only beauty products (and boy! Are there beauty products!) but also fashion and lots of tutorials. Every single magazine I picked up had a tutorial of some sort, be it how to draw eyeliner, how to put on blush, or how to apply eyeshadow, they show you multiple ways you can do it. They also have comparisons between products from different brands e.g. how different pen concealers fare and which is better. The Chinese magazines from Taiwan were far superior in this regard. The one in the 1st picture is Vivi which I’m given to understand is the Taiwanese version of the original Vivi – a Japanese mag. I’m starting to understand why Asian cosmetics and brands do better in Taiwan and Japan. The mags are not only full of them, they tell you how to use them. The other pictures you see here are from local Chinese mags which, while not as cutesy as Vivi are as informative. I’m also beginning to understand why there are so many Asian makeup “gurus” on Youtube and in beauty blogs. If you live in a country where magazines teach you important things like how to use eyeliner, it is no wonder they grow up more savvy in all things makeup, and it is no wonder that makeup and cosmetics sell well. By contrast, I find that English or Western magazines aren’t as tutorial nor information friendly. The pictures are there, but other than show you what it is, they don’t “teach” you. In many ways, I feel like I’m reading a large glossy advertorial. I have one caveat though. I’m not into the looks created and shown, like that in the cover of Vivi above. The other more natural looks in the other 2 pictures are more wearable. I’m not into the whole look involving false lashes, colour contacts, curled hair dyed brown or blonde, and taking photos with that “Look at me! I’m so cute!” look. Vivi was full of girls who looked like that. It is no wonder I’m seeing a plethora of blogs with girls who look like this (or are photoshopped to). So the next time I go to my hairdresser, I’m going to be skipping my regular dose of Cleo and Her World etc and will be picking up Vivi and any other Chinese women’s magazine they have lying around. I may not understand what they are saying, but their pictures are enough to teach me a thing or two 🙂 And then I’d tone it down to use for everyday so I don’t end up looking like a manga character LOL! If you can read Chinese, lucky you! But if you don’t, do you enjoy flipping through Chinese magazines anyway to look at the pictures and tutorials? i adore my chinese mags to the point i stop reading english ones! Since I can’t read I can’t tell which is better but both foreign and local mags give good picture tutorials which I find useful. Western mags or English mags should pick up that trend – I think it most useful for the majority and will encourage people to buy and keep the mags instead of tossing them out after a month or two. i don’t toss my magazines. i keep them like how i keep my books! it’s insane to be honest. I absolutely hate it when my hairdresser “runs out” of English mags and I have to flip through the Chinese ones. Like you, I was traumatized at kindy stage and never got around to conquering what is supposedly my mother tongue. I think that they’re Taiwan’s most famous makeup artists. Celebrity status like Bobbi Brown and whatnot. I got a makeup book by Kelvin (in Mandarin, of course) for RMB25 in China for my friend. It was very informative, like those chinese mags. If you are interested enough, you would learn the language I’m sure. My mum’s boss learnt it through Karaoke sessions. Oh yes I like the fact they feature a whole bunch of products of different price ranges. There’s less segregation but I’m wondering if it might be because Asian and Japanese brands of cosmetics have so many sub brands that it doesn’t matter whether they feature the cheap drugstore version or the higher end department store version. Hehe never a better way to learn a language than when you need to 😉 I love browsing Japanese mags too! Some bug me cos of the cute factor but the fashion is fun! You’re absolutely right Jess! Bring on the translators already! Wow that’s so cool! I love the eyebrow of the second girl in the chinese mag! perfect! Same here, I love them more, I bought VIVI magazine when I visited HK, I guess their makeup tuts are more on the natural side and they have great step by step photos! I just don’t buy magazines, period. Mostly because I’ll probably only read through once and then I don’t know what to do with them. So I just flip through at the bookshops 😛 But no, I’ve never touched the Chinese/Japanese magazines just because. Even though I can read Mandarin (Chinese primary school and all), but the comprehension is pretty crap and it’ll take me longer to read than I would reading English. I love the mags not only for their makeup tutorials but some clothes are really nice too! One more thing! Chinese mags do hair too! “How to” guides to styling your hair! offers more toned down and mature looks compared to . so much so that i always take a copy of vivi/cawaii/etc to browse thru at borders 😀 bcos it would be senseless to buy a mag that i can’t even read…i will look at all the pics and the beautiful clothes! why can’t cleo publish these makeup tutorials?! 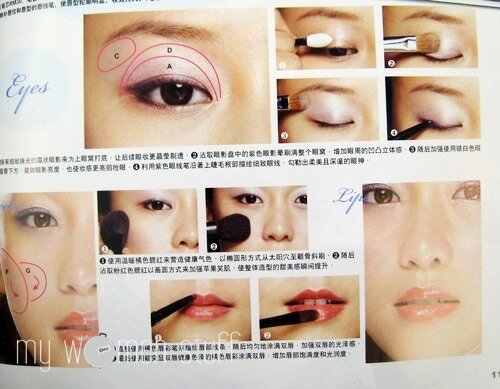 I think it would be awesome if the English mags had more of these tutorials, whether for simple or elaborate looks. We’d probably enjoy and buy more if there’s a reason to i.e. to keep and learn from it. I bought a few ViVi, VoCE, Choc and I don’t remember what else when I was in HK early this year. I bought more when I was at HKIA. I can read Chinese but am not very good in that. I was never interested in my Mandarin lessons. I preferred reading Sweet Valley High than listening to the teacher *lol* I like the makeup tips in the mags. I’m not into the entire kawaii makeup or the poses. English mags cost a lot here. My husband bought me a year of subscription of Cosmo US last Christmas. To be honest, I don’t really like the US version that much. I prefer the UK or the Australia ones! I love Japanese and Taiwanese mags, and my excuse for buying them is usually to brush up on Mandarin and Japanese 😛 I find it hard to read the text in the East Asian mags though, as they’re so small that I tend to get lazy and just look at the pictures. That said, I still love Vogue UK and US as the features in these mags are pretty interesting. So for me it’s Vogue for a good overall read, and East Asian mags for eye-candy. That’s a nice dissection of your mag reads! I must say some features in English mags are a good read but it could just be that I can’t read features in Chinese mags so I can’t appreciate them! Lol! “With” is my face Chinese mag – chock full of fashion and beauty how-to pics especially haircuts and styles – shots of front,sides and back! I know what you mean about hair – I’d never be able to do my hair without pictures! Come to think of it I still can’t even with pictures :p Why would you be bad mouthed for doing the kawaii look? Lots of girls do 😉 maybe you can do something less dramatic? hi, you have just inspired me to read chinese beauty mag!! what other chinese mag are there other than vivi which is good?